CLEARFIELD –The Ritz Theater in Clearfield was the site of the opening gala for the first film festival to be held in the area Thursday evening. 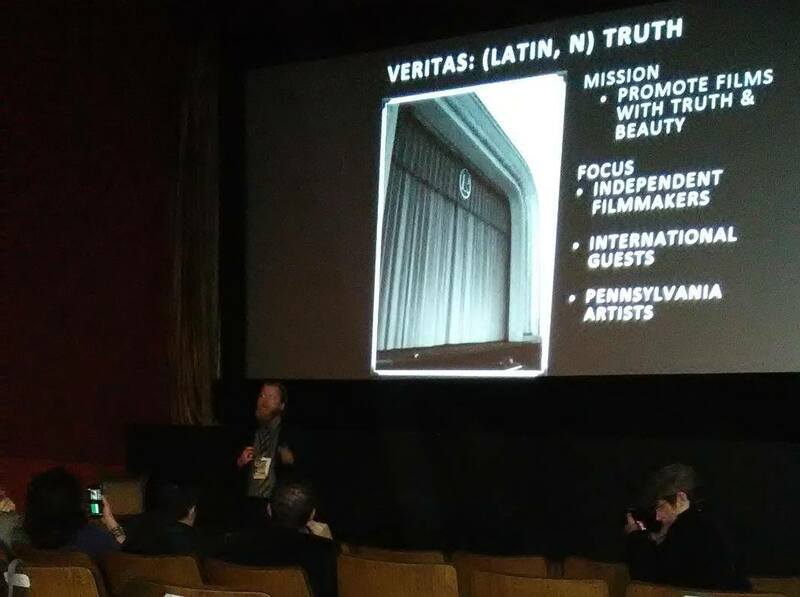 The Veritas Film Festival features a full week of movies daily at both the Ritz and the historic Rowland Theatre in Philipsburg. Each day features films in a different category shown at the two theaters. Friday-feature films, Saturday-student films, Sunday-Hard Faith films, Monday- films made in Pennsylvania, Tuesday-documentaries, Wednesday- screenplays read live by actors, and Thursday-short films. Each night there will be an award ceremony at the Rowland. There will also be encore presentations of some of the winning films later in the week. Folmar explained that he chose Veritas as the name for the festival because it means truth. Out of 375 submissions, he only accepted 93 of them. He stated that Visit Clearfield County, the local tourism authority, “took a big chance on us” by sponsoring the festival. Josiah Jones, executive director of VCC, credited Folmar with bringing this event to the area. “This place is special with a lot to offer filmmakers,” Jones said, listing our natural resources and local business such as Denny’s Beer Barrel Pub, Grice Gun Shop and the Depot at Doolittle’s. All three County Commissioners were on hand to speak. John Sobel welcomed the guests, encouraging them to make themselves at home. Although officials have always been looking into ways to spotlight Clearfield, they never thought of it as being a site for film makers, he said. “This is so exciting for us,” McCracken said, adding that he was looking forward to this being an annual event. Tony Scotto also thanked Folmar and urged everyone to get to know the “kind and generous people” who live here. One of the sponsors, Kenn Starr of Starr Hill Winery talked about the impact of the show “Fireball Run” that he was involved with a few years ago. (The program can still be seen on Amazon Prime). The show had stops in Clearfield County and during filming they booked an entire hotel. Starr also mentioned Folmar’s latest film, “Shooting Heroin,” which was filmed here recently as having an impact on the local economy. When Folmar asked Starr to sponsor the “Made in PA” day of the festival, Starr said he quickly agreed because that is what Starr Hill Winery is all about. Main Street Manager Loretta Wagner spoke briefly about how exciting it is to “see our hometown on the screen” and welcomed everyone. Bob Knepp, owner of the Ritz Theater, spoke about how the film business has changed in 32 years, going from reels that needed changed every 20 minutes to the current digital system. Knepp, who was previously a truck driver, commented that he used to go home smelling like fuel, but now he smells like popcorn. Rebecca Inlow, who as a board member for the Rowland Theatre books feature films there, agreed that it is becoming more difficult for small theaters because the studios have such control. They dictate the terms of the movies and she has to work with them because they want to bring popular movies to the theater. Still, she tries to also get critically acclaimed and independent films once in a while, she said. “I grew up watching movies at the Rowland,” Inlow said. “It is up to us to see that the Rowland and Ritz stories continue.” She then urged everyone to see movies at their small-town theaters. Gary Pastore, one of the stars of “Shooting Heroin,” who has appeared in numerous TV shows and movies, spoke about his experiences in show business. He said he got his role in “Shooting Heroin” on Friday and was in the car on Saturday to get to the area. In the movie, he plays a small-town sheriff instead of his usual gangster or police officer roles. He stated that everyone has been “sweet” to the cast and crew and said he would love to work with Folmar again. “I think magic will come out of this film, because of him (Folmar).” He also stated that we are lucky to have someone with such love and respect for the area. Folmar commented on the lasting impressions of others who worked on his previous film, “Generational Sins,” that was also filmed locally. He said they continue to ask him about Clearfield County and if he has visited their favorite sites such as the Super 322 Drive-In on his latest trips. Once someone has been here, “it sticks with you,” he said. Catalano is also very talented having made several successful online series including NFL Rhyme Reel, which he said he started in his basement. A version of the show by Pepsi was done for the Super Bowl. He commented that it is an exciting time to be a filmmaker because there are so many outlets for material due to streaming services. The group then moved to the Moena restaurant where they enjoyed dinner. For a list of the films and their showtimes, go to www.veritasfest.com.